The Cisco Nexus® 9000 Series Switches product family makes the next generation of data center switching accessible to customers of any size. 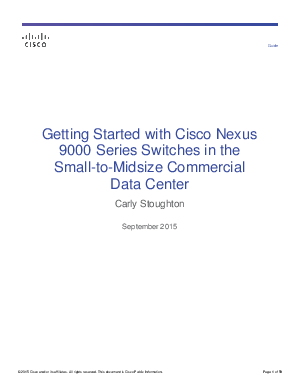 This white paper is intended for commercial customers new to Cisco Nexus 9000 Series Switches who are curious how the switches might be feasibly deployed in their data centers. This white paper highlights the benefits of Cisco Nexus 9000 Series Switches, outlines several designs suitable for small-to-midsize customer deployments, discusses integration with existing networks, and walks through a topology validated by Cisco for Cisco Nexus 9000 Series Switches, complete with configuration examples. The featured designs are practical for both entry-level insertion of Cisco Nexus 9000 Series Switches, and for existing or growing organizations that are scaling out the data center. The configuration examples transform the logical designs into tangible easy-to-use templates, simplifying deployment and operations for organizations with a small or growing IT staff. Optionally, you can learn how to get started with the many powerful programmability features of Cisco NX-OS from a beginner’s perspective by seeing Addendum A, “Automation and Programmability,” at the end of this document. This white paper also provides many valuable links for further reading about protocols, solutions, and designs discussed. A thorough discussion on the programmability features of Cisco Nexus 9000 Series Switches are out of the scope of this document.